Continent of the Ninth Seal (C9) combines action with the MMO formula to create a fast paced fantasy style experience for MMO fans who want something more hands on. Continent of the Ninth Seal Is fairly new to the MMO scene and was released in late 2012 for PC. Uniquely the game has an almost FPS style feel to the controls and plays out more like an old fashioned action RPG than an MMORPG. The story and background of the game leave a lot to be desired though with players taking on the role of an adventurer in the world of Tampera as they fight evil monsters, raid dungeons with others and of course prove their worthiness in PvP engagements. Continent of the Ninth Seal offers 4 different classes for players to choose from which are gender locked into their roles which does cut down on customisation a little. Classes include the fighter, hunter, shaman and witchblade. Each of these core classes is able to advance to one of three possible advanced classes which is when the gameplay really starts to take off. PvP was definitely slightly favoured by the developers and will consume most of your time after you get through your early levels. For fans of questing there are still plenty of quests available and the developers have done a great job at capturing a land overrun by evil as there are countless enemies everywhere you look. 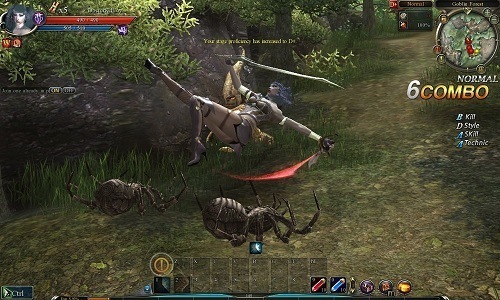 The most unique and exciting feature of C9 though is the dungeon invasions that allow groups of players to invade active dungeons and instances. If players are able to kill the party currently attempting the instance they’ll receive greatly increased experience in loot. This adds a whole new level to instanced gameplay as you now have to worry about getting through the instance and making sure you don’t get attacked by other players. C9 was definitely designed with PvP in mind although the instanced experiences are still fairly impressive. Fans of PvP will enjoy what is on offer but if you prefer your PvE you might want to look elsewhere. Plenty of class options despite only 4 base classes. Dungeon invasions had a whole new level of intensity to instances. PvP focused with solid PvE. Impressive and varied soundtrack works well with the action gameplay.